Cliffe FC’s weekend was as follows – First Team bowed out of County Cup with a 6-2 after-extra-time defeat to Hodgsons, Reserves also are out of County Cup with narrow 5-4 defeat to Brandesburton Reserves. 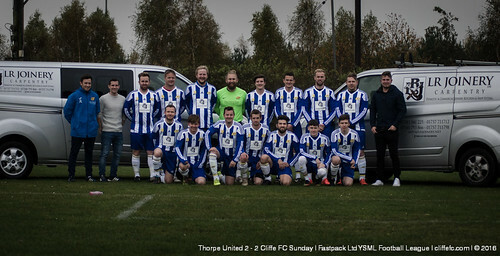 Sunday was a league draw between Cliffe FC and Thorpe United, 2-2 the score. With Oxen Lane under drainage works, Cliffe FC were afforded the kind lend of Selby Town’s pitch, Hodgsons AFC the visitors from ER County League Division 1. It was the away side that had the lead after 15 minutes, a counter attack switched to the back post on the left wing for a low shot into the net, 0-1. Cliffe responded with their best spell of the tie, first equalising with a volley from Dan Richardson, Dan Collins with the assist, 1-1. Cliffe had the lead soon after, a quick corner from Collins to James Grundy – who set himself on the edge of the box and hit a curled effort that evaded everyone and the ‘keeper, 2-1 to Cliffe. Cliffe remained the better of the two side without extended their lead, and were punished just before half-time, a Hodgsons corner breaking to the edge of the box for a crashing shot that went in – 2-2 at the break. Hodgsons came out the better of the two sides second half, but Cliffe handled the pressure well enough – but the home side were unable to carve out any clear chances either, 2-2 after 90 minutes and the tie went to extra-time. Hodgsons got themselves in front just midway through the first period of extra-time, a header at the near post, Dan Shaw in the Cliffe goal adamant he had both hands on the ball, 2-3. Cliffe changed formation for the second 15 minutes to chase the game, but were picked off a couple more times to see Hodgsons extend their lead to 2-5, and with Cliffe staying in all-out-attack, they conceded once more to bow out of the cup with a 2-6 reversal, FT AET. Cliffe’s MOTM was Eddie Gobby, another impressive display. Cliffe FC return to their league scheduled next week, Rawcliffe are the opponents in YMEL Division 1. Cliffe FC Reserves are also out of their section of the County FA Cup – a 5-4 defeat away to Brandesburton Reserves. Cliffe’s goalscorers were Kieran Gallagher, a first Cliffe goal from William Yarrow, Tim Mizen, and a superb effort from veteran Simeon Leach – 90 minutes and a goal from the 50 year old. MOTM: Kieran Dinsdale. Next week it’s Civil Service Reserves away for Cliffe FC’s second string. A score-draw between the bottom two sides in the YSML Division 1 – 2-2 the final score, but a feeling of two points dropped by Cliffe’s side. The morning began with the unveiling of the new kit, as sponsored by L R Joinery – a photo call with with Lee Carter and Richard Gibbons of L R Joinery before the warm up took place. Cliffe looked more likely to score from the kick-off, but after a set of wasted chances, Thorpe got themselves a penalty. Scott Birch saved superbly in the Cliffe goal and some great last ditch blocks on the line kept the score at 0-0. Luke Zacharenko got Cliffe ahead, a Zola-esque flick from a corner to put it past the ‘keeper to put the away side 1-0 up before HT, a welcome lead at the break. For all Cliffe’s dominance in the first half, Thorpe got themselves both level and quickly in front – first pouncing on a short clearance from Birch in goal, to finish into an empty net, 1-1. Then a stooping header from a low cross put the home side into an unlikely lead, 2-1. 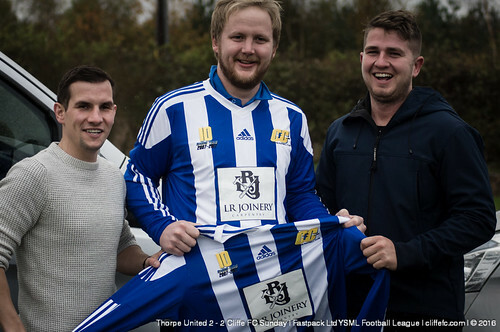 Cliffe now had it all to do, and it took an individual effort from Tom Hogg to get Cliffe level – breaking from centre-back, beating his marker and hitting a low left-foot drive past the ‘keeper for 2-2. Cliffe now had all the pressure, Tom Collins hitting the post, Nathan Parker, Dan Collins, Zacharenko and Hogg all coming close to putting Cliffe ahead but time ran out and 2-2 saw the points shared. MOTM: Callum Ransome for good display at left-back. Next week it’s Marcia Bishopthorpe in league action.